You’ll like a little special attention, but you may not get it when you want it! Check your motivations, since if you’re too self-absorbed it can backfire and then you’ll really be disappointed. Inner fitness — affirming your strengths and releasing old emotional blocks—plays a significant role in your sense of well-being. Recreation, entertainment, and play uplift your spirits and add their own healing qualities. Get in touch with the deeper essence of love for a glow that can be quite attractive. Even though you may feel ready for something different during the Moon on June 13, there may still be unfinished business with an old lover. 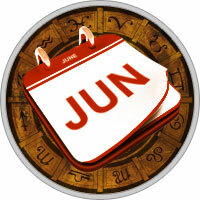 Letting go of the past is easier during the Moon on June 28, but you may have to deal with the issue before then. Bring fantasy into your love life by adopting a more playful attitude and demanding less of your lover. Professional alliances give you the edge in business through June 20, but you can be deceived by someone whose jealousy or shortsightedness creates problems from June 5 to 11. Large expenditures can carry surprising obligations from June 13 to 20, and if you can postpone them, you may find a better bargain after June 21. Speculative ventures appear excessively risky from June 7 to 26. Let your imagination guide you in creative endeavors, but give yourself time before you expose your creations. This is a testing phase.